The fake gunwales on the rear of the hull fall away, and the masts come down (hopefully not on someone's head). Suddenly, the boat is less encumbered, more free to speed out to open sea where the good ole USAF can provide adequate air support. If you're found out, says Spycraft co-author Keith Melton, this would increase "your chance of living," which is nice. 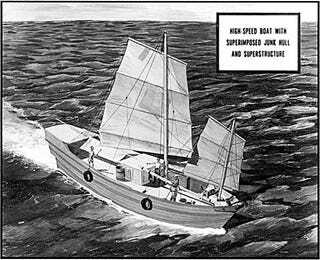 Boats like this were definitely in use, though the CIA will not say how often, or in what specific situations. Melton says the concept is similar to an earlier one, the Q Boat or Mystery Ship, a gunship masked as a merchant vessel used during World War I to lure submarines to the surface.